The giant asteroid Vesta, the brightest asteroid in the sky, will be very visible for the next two weeks. This image of Vesta was captured by NASA's Dawn spacecraft in 2012. The next two weeks provide an excellent opportunity to spot the brightest asteroid visible from EarthVesta — one of the best-known objects in the solar system. In the first six years of the 19th century, astronomers discovered four new members of the solar system. All four were small objects between the orbits of Mars and Jupiter. Initially, they were called planets, but by the mid-1800s, enough new objects had been found in this area that they were given a category of their own, much as Pluto was reclassified from a planet to a dwarf planet. They were called "asteroids" because they were so small that they looked just like stars in the telescopes of the day. Now, there are tens of thousands of known asteroids. The rest of us have to make do with binoculars. Here's how to find it. A wide-angle view of the autumn constellations, showing the position of the asteroid Vesta in the constellation Cetus. The first chart, above, shows Vesta's overall position among the constellations of autumn. The two left-hand stars of the Square of Pegasus, Alpheratz and Algenib, point southward across the circlet of Pisces to the constellation Cetus, the Whale. Look for a large triangle formed by Eta, Iota Ceti and Deneb Kaitos. The latter is easy to spot because, although it's only second magnitude, it is by far the brightest star in this rather dim part of the sky. Eta and Iota are both magnitude 3.5, so they're quite a lot dimmer than Deneb Kaitos. A close-up of the westernmost stars of Cetus, showing the position of the asteroid Vesta over the next two weeks. The second chart shows these three stars in detail, as well as the path of Vesta over the next two weeks. The leftmost end of Vesta's path (marked with the label on the chart) is its position on Wednesday, Sept. 30, and the points on the trail to the right show its position each night after that in October. Vesta should be quite easy to spot, since it is about two magnitudes brighter than any of the stars along its track. Just to be sure, make a simple plot of the stars in its vicinity, and then check again a night or two later. The "star" that has moved is certain to be Vesta. 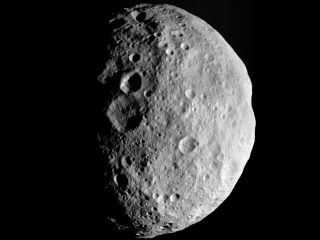 Vesta is now one of the best-known objects in the solar system because NASA's Dawn spacecraft orbited the asteroid for more than a year (from July 2011 to September 2012). This is a great chance for you to see it with your own eyes.